These Double Chocolate Frosted Almond Cookies, made with Fair Trade products are sure to satisfy any chocolate craving you might have. 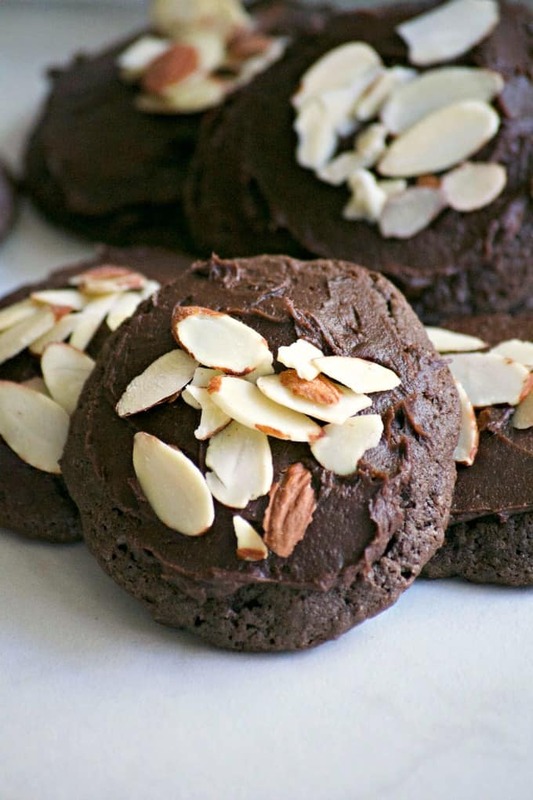 Almond paste, sliced almonds, double chocolate chips and chocolate frosting make these cookies very hard to resist! Every six months or so I participate in a post to promote Fair Trade certified products. 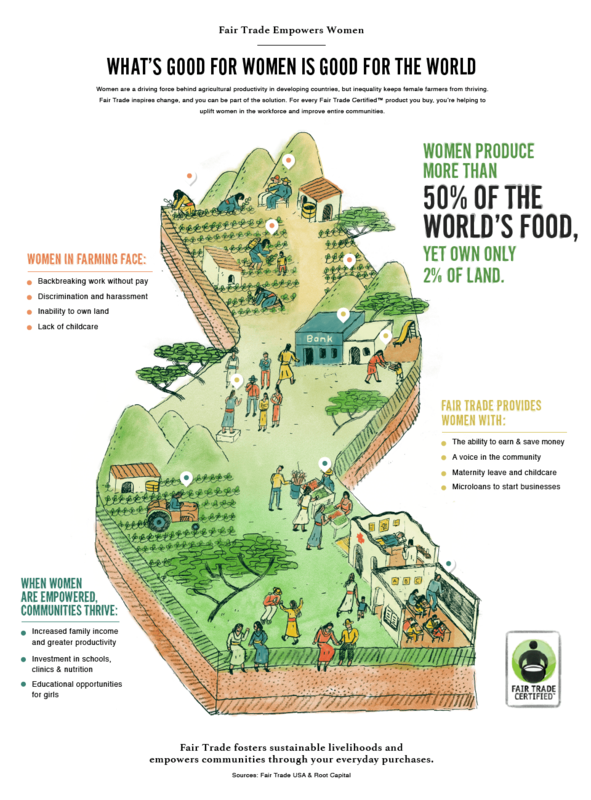 So, in celebration of Mother’s Day and the incredibly hard working women around the world, I am proud to partner with Fair Trade USA once again. I want to tell you about them because I strongly believe in their organization and the products they provide. The main reason I love them is that when I purchase any of the items with the Fair Trade Certified symbol I’m helping the 1.2 million farmers and their families in 70 countries, and you can as well. Not only that, but the products are well made and I love using the ingredients in my kitchen. For more information, I encourage you to visit Fair Trade USA. This post contains an affiliate links. These are links that can take you to a products that I recommend. I do receive a portion of the sales or credit for my future purchases from any items purchased through those links. Your purchases encourage my baking, cooking and butter habit, and contribute to the life of this blog. I thank you so very much for your support. Let’s keep having fun in the kitchen!! In these Double Chocolate Frosted Almond Cookies, I used Wholesome Organic Cane Sugar, Guittard Extra Dark Chocolate Baking Chips, and Wholesome Organic Chocolate Frosting. 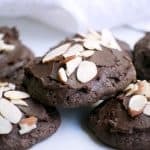 The dark chocolate chips combined with the almond paste, sliced almonds and chocolate frosting made these cookies super delicious and ones I’m going to want to make again and again. I think you will, too! As I said, I’ve made other recipes in partnership with Fair Trade. This Easy Tiramisu Poke Cake is probably my favorite since I love coffee so much. It is super easy to make, too! If you’re a coconut lover, this Double Chocolate Coconut Cream Filled Bundt Cake is definitely for you. It’s so very moist and full of flavor. For a different kind of cookie, try these Turmeric Tea Cookies. They really are perfect with a cup of tea. Mom will love these Banana Chocolate Scones. Make them for her for Mother’s Day. 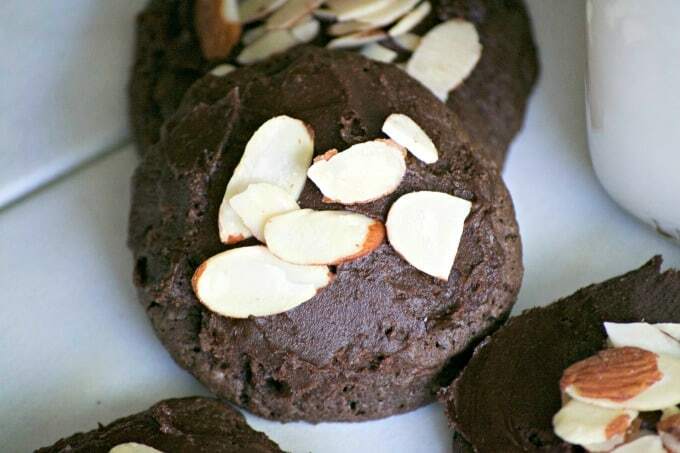 These Double Chocolate Frosted Almond Cookies, made with Fair Trade products are sure to satisfy any chocolate craving. Almond paste, sliced almonds, double chocolate chips and chocolate frosting make these cookies very hard to resist! Make them and help support Fair Trade communities. Preheat oven to 350 degrees F. and prepare two baking sheets with parchment paper. In a mixing bowl, cream together the butter, sugar and almond paste until smooth and creamy, about 5 minutes. Add the vanilla and almond extracts and combine. Add the eggs, one at a time and incorporating fully. Add the dry ingredients to the creamed butter in two batches until just combined. 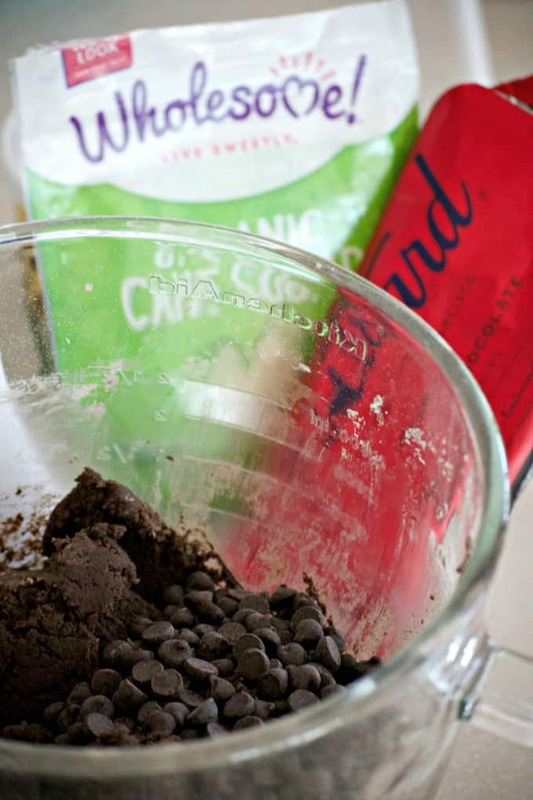 Mix in 1/3 cup of the sliced almonds and the chocolate baking chips. Using a cookie scoop the size of a tablespoon place the dough onto the prepared baking sheet. Gently press onto the dough, and flatten each into a small disk with your fingers. Allow to cool slightly before transferring to a wire rack to cool completely. Frost with the Wholesome Organic Chocolate Frosting and sprinkle each cookie with some sliced almonds. I, along with these companies, appreciate and thank you for your support!